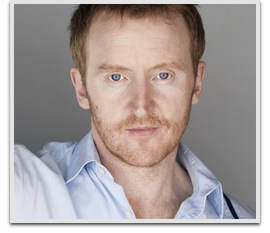 Scottish born actor Tony Curran began his career with appearances in British productions Being Human, starring Robin Williams and Shallow Grave, the directorial debut of Academy Award winner Danny Boyle. Following those roles, Curran rose to fame in the BBC television series This Life as the character Lenny. After establishing himself as a notable television star, Curran began appearing in high profile film roles including The League of Extraordinary Gentlemen alongside screen legend Sean Connery. As The Invisible Man, Curran needed to wear a blue screen suit that covered him from head to toe in order to achieve the extraordinary effects seen in the film. Genre fans will also recognize Curran from his roles as vampire in Guillermo del Toro’s Blade II as Priest and Underworld: Evolution as Marcus. Doctor Who fans fondly remember Curran for his portrayal of the painter Vincent van Gogh, in the Doctor Who episode “Vincent and the Doctor”, written by Richard Curtis. Although appearing in only one episode as the artist, Curran’s performance endeared him to the loyal Doctor Who fan base. Eagle eyed fans will also recall Curran’s cameo appearance in the episode “The Pandorica Opens”. In 2011, Curran appeared as Lieutenant Delcourt, in Steven Spielberg’s entirely CG production of The Adventures of Tintin: Secret of the Unicorn and also voiced the character of Captain MacMillan in Call of Duty: Modern Warfare 3. In 2013, Curran appeared in the hit sequel Thor: The Dark World and made an appearance in Sons of Anarchy in 2014. Tony Curran can currently be seen in the SyFy series Defiance as the character Datak Tarr.